To understand the history of Strathbungo, it helps to understand the issues of land ownership and boundaries. King David I (1124-1153) granted by charter lands of Govan to the See of St. Kentigern of Glasgow in 1136, when Glasgow Cathedral was formally consecrated. Thus much of the land south of the Clyde came to belong to the church in Glasgow. A late 16th century Act of the Scottish Parliament directed that church lands were to be “directed to be conveyed to rentallers and others, in order that by their care, industry, and labour, as wise men, the lands might be manured and improved, and made to yield better crops.” By this means, in 1577-8 a merchant in Glasgow, Sir George Elphinstone, acquired the lands of Gorbals and Bridgend, shortly followed by the Maxwells’ purchase of land to the west that came to make up the Pollok estate. Sir John Maxwell first settled in the area in the mid 1200s, and generations of Maxwells, also mostly called John, followed. They rented their lands south of the Clyde from the church, but on 8 June 1581 the Maxwells acquired the lands of Haggs, Shields and Titwood outright by feu from the Archbishop of Glasgow. In 1585 Haggs Castle was constructed as the Maxwell’s home. In 1630 Sir John Maxwell was created the 1st Baronet by King Charles I, but he died without a successor. In 1682 another Sir John Maxwell petitioned King Charles II to restore the Baronetcy, becoming rather confusingly the second 1st Baronet! He in turn was succeeded as 2nd Baronet by his cousin, another John, who commissioned Pollok House in 1747. The house was completed in 1752, weeks before John’s death. Haggs Castle became a dowager’s home, then fell into disrepair. Sir John Maxwell, 8th Baronet of Pollok (12 May 1791 – 6 June 1865), began its restoration in 1860, and after a number of uses, including the Glasgow Museum of Childhood from 1972 to 1998, it is now once again a private home. The Maxwells’ land included Nether Pollok, and the farms of Titwood and Shiels. It also included the land on which the village of Strathbungo, and subsequently the Squares and Gardens of modern Strathbungo, were built. The 8th Baronet was responsible for the sale of lands that led to the development of Strathbungo as we know it. The land that is modern Strathbungo was feued to John McIntyre, a builder, and William Stevenson, a quarryman, in 1859-60. The Gorbals land became a Barony under the Elphinstones, but in 1634 passed to Viscount Belhaven, whose nephew sold them to the Magistrates of Glasgow, Hutchesons’ Hospital and the Trades House. This tract of land included Hutchesontown, Laurieston, Tradeston, and Kingston, and it extended southwards to the northern edge of Strathbungo village. In 1878 the City extended to include these lands within its boundary. The village of Strathbungo was centred on what is now the junction of Pollokshaws Road and Nithsdale Street/Allison Street. It was predominantly on Maxwell land, in the Parish of Govan, and the County of Renfrew. 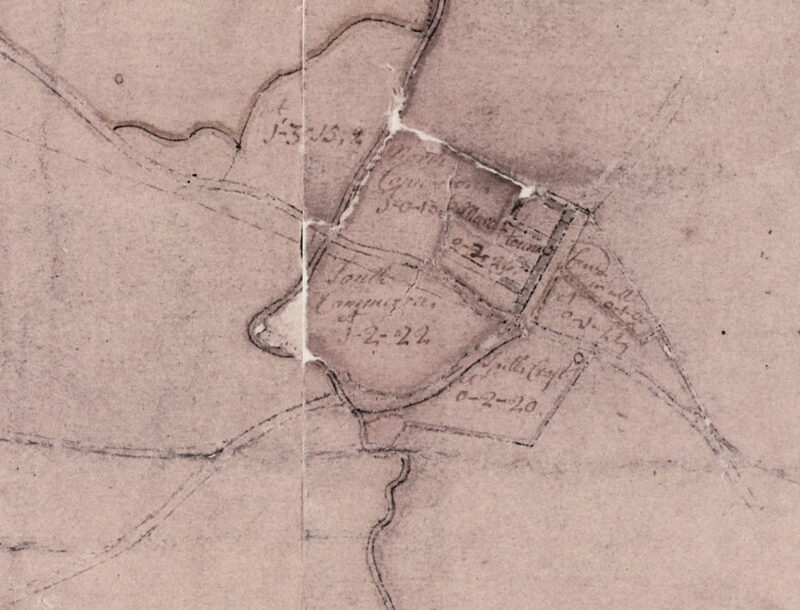 The first clear map of Strathbungo is a plan of the Pollok estate prepared in 1741 by Robert Ogilvy, a local surveyor, although it is named Marchtown. The village was originally built on a small knowe, that fell away to the Kininghouse Burn to the west and the Crosshill Burn to the south, but this is much less apparent now. It would have looked over the Gorbals moor to the north, and the Shaw Moss to the south. Gorbals parish originally extended from Partick and Braehead in the west to the Gorbals and Polmadie in the east, but in 1771 Gorbals was disjoined and became a parish on its own. The parish boundaries between Govan, Gorbals and Cathcart left Strathbungo in a small enclave in the extreme south east corner of Govan Parish. South of the village the burn was said to be the boundary, land to the west of it being in Govan Parish, although other maps suggest it all was in Cathcart parish, along with Crossmyloof and what would become Queens Park. The county and parish boundaries crossed through the village east-west, north of Allison Street, immediately south of Strathbungo Parish Church, and then across the northern end of March Street east-west, before turning North along the burn and crossing Nithsdale Drive. This explains the white 21st century tenement on the corner or March Street and Nithsdale Drive; when Sir John Maxwell feued the land for the building of the Salisbury Quadrant tenement, he didn’t own that small corner, as it was in Lanarkshire and belonged to the city. He tried to buy it, but the deal fell through, and the ring of Victorian tenements was left incomplete for more than 100 years. The Maxwells of Pollok’s lands of Titwood matched the county boundary. The land immediately north of Strathbungo was in Lanarkshire and Gorbals; between the burn and the main road it belonged to the city, while to the east of the road (Coplawhill) it belonged to Hutcheson’s Hospital. 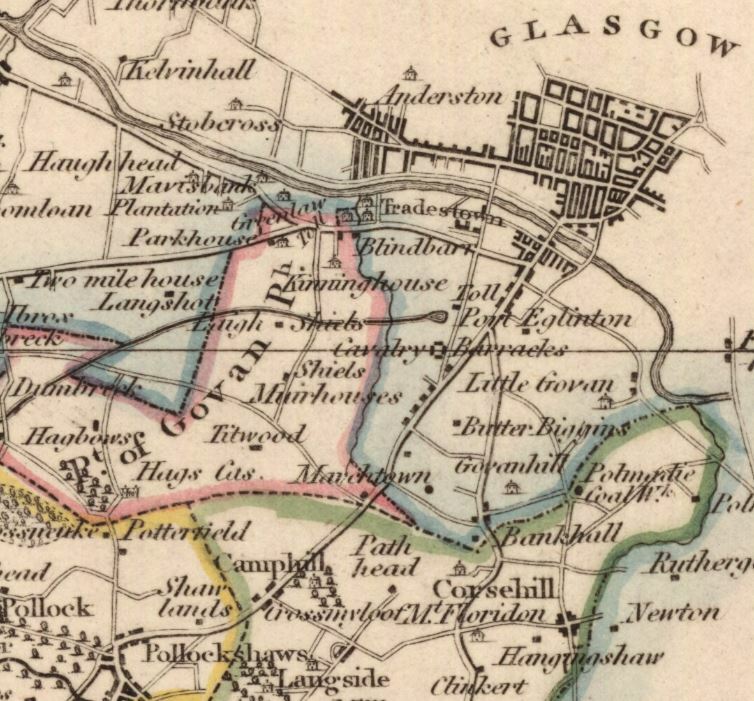 These boundaries are better illustrated in a map of 1826, which shows Strathbungo, or Marchtown, nestled in the south east corner of Maxwell’s land, which is in Govan parish, but in Renfrewshire, outlined in pink. Govan and Gorbals outlined in blue, are in Lanarkshire, as is Cathcart, in green. The Kinninghouse Burn, which ran north through Strathbungo to the Clyde, became the border between the Govan and Gorbals lands, and between the counties of Renfrewshire and Lanarkshire. Houses built over the burn were apparently of great value to those with debts, as they allowed a resident to escape to the rear of the house in the next county whenever a sheriff came calling at the front door! Many argue about the true location and boundaries of Strathbungo today, but rest assured, it doesn’t seem it was any clearer in older times. Strathbungo was not the name favoured by the Maxwells at that time. Their alternative name, Marchtown (Marchton, Marchtoun) reflects the village’s location on so many marches (boundaries); the Govan & Cathcart Parishes, the lands of Pollok and Govan, and the counties of Renfrew and Lanark. It appears on their estate map on 1741. The first appearance of Strathbungo on a map is 1773. Nevertheless, in the long run, Strathbungo won out, and Marchtown only lives on in the name of March Street. A new cafe/bar on Pollokshaws Road intends to revive the name in 2017 however. There are numerous theories regarding the origin of the name Strathbungo. It is hard to beat the summary given by Alexander Scott in his Notes on the Village of Strathbungo, 1886. “What is the origin of the name of the village? A correspondence a few years ago in the Glasgow Herald on the subject of the name may be remembered. In that correspondence it was contended by one writer that Strathbungo was a slang name; another considered that it was probably a corruption of Strathmungo; and others held that the real name was March town. The feuing of the village commenced about the beginning of last century. In the earliest of the feu-rights no name is given to it, but by-and- by the name of “Marchtoun” is to be found in the deeds granted by Maxwell of Pollok the superior. Probably the then laird of Pollok did not like Strathbungo as a name, and he therefore substituted “Marchtoun.” “Marchtoun is quite descriptive of the village; but in reality it is only what may be called a feuing name. There were various marches here, but three may be named — the march between Lanarkshire and Renfrewshire; that between the parishes of Cathcart and Govan; and the third between the Titwood lands and the barony of Gorbals. As has been stated, “Marchtoun” occurs on the plan of 1741; but this was natural, for the plan was prepared by a surveyor on the superior’s instructions. It also occurs on the map of Renfrewshire by John Ainslie of Edinburgh with the spelling of “Marchtown.” Knox (Mr. Ainslie’s successor) informs us that Ainslie, who was at the head of his profession, personally made the survey for that map in 1795. Doubtless he got the name, not from the Strathbungo people, but from the Pollok officials, for he was always in a hurry, and spent very little time about anything. When we find the name of Marchtown in any subsequent map, it may be taken for granted that Ainslie’s name of the village has simply been copied. “Strathbungo as a name is unknown to history. The probable earliest mention of it on plan or in book is on a private plan of the barony and regality of Glasgow prepared in 1773; although on that plan it is inaccurately placed. Semple, in his continuation in 1782 of Crawford’s History of Renfrewshire, speaks of the lands of “Strobungo” as the property of Mr. Robert Crawford of Posle; but he is wrong as to the ownership. What have the old inhabitants of the village — men who were living in the end of last century — to say on the point? The information from them is that the proper name is “Strabungo,” not “Strathbungo ” (for there is no strath), and that it was handed down from their forefathers. While, therefore, it may be held that “Strabungo” was the old name, we naturally ask what is its derivation. One is on somewhat slippery ground when dealing with the derivation of place-names, and without thorough philological as well as local knowledge it is hazardous to attempt the derivation of such a singular-looking name as Strathbungo. Strabane is a well-enough known Celtic place-name. We have Strabane in Tyrone which took its name from the meadow-land along the river Mourne —Srath-bán, the fair or whitish river holm. Probably the derivation of the name of Strathbungo is to be found among the roots of the Celtic language, and Strabane-go, otherwise Strathbungo, may mean much prized fair or whitish meadow-land along the burn side. It is assumed that the name, like several others in the neighbourhood, is of Celtic origin; and doubtless the old hospital may have been the means of preserving it. I also came across this curiosity. According to David Panton, during the 1980s a table of bus connections at Glasgow Central listed this spot, rather racily, as Strathbumgo. Hmm.